Campbell has recently been getting better and better at reading, just as his sister did when she turned four years old. It is still too early to tell, but he might be a little bit ahead. But he has taken to doing something that I don’t think Mara really did when she was younger. 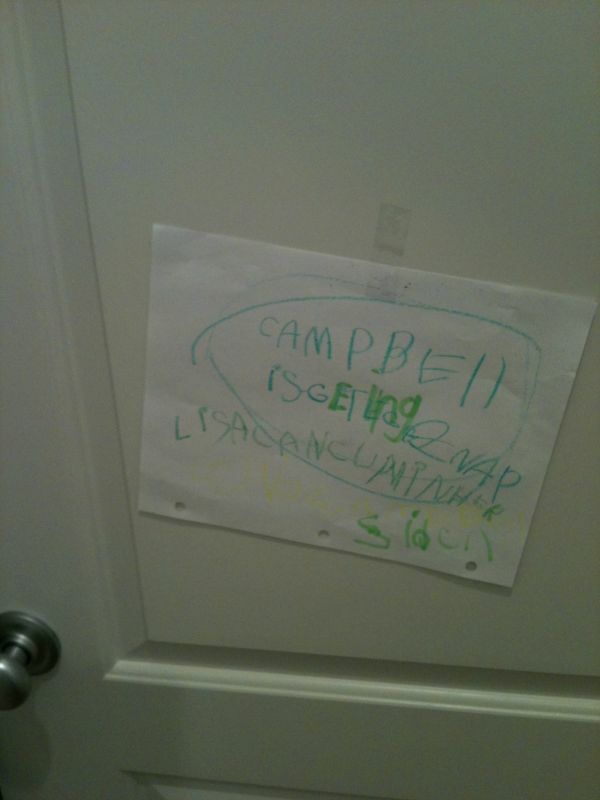 She used to write and practice her letters often, and Campbell does the same. What is different is that he is also beginning to write words at this point. Sometimes he asks for one of us to spell the words for him. What we have seen at times though is that he likes to just give it a go at writing his own notes independently. This results in some very funny outcomes. I have taken pictures of a couple of his writings. The first is a sign that he made to hang on his door. If you can interpret it you are a little better than me. He just came out and explained it to me one day. “When the door is closed, you have to read the sign,” he says. When first looking at it you could easily just mistake it for random letters and scribble. The second is a card that he made for me when I was away on a business trip. 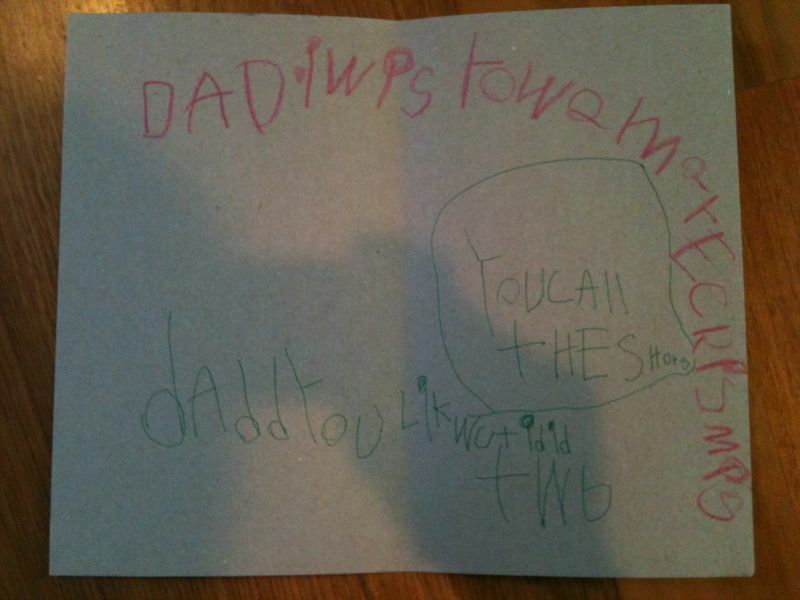 He started writing it, and then showed it to Mom. She advised that he copy one of the cards he had received for his birthday for the middle portion of it. This is the clearest item on there. The rest he originated himself. Can you read what it says? Put your mouse over each picture to see what it says. Oh, Campbell, I’m so proud of you! What a good writer and communicator you are. I bet you and Mara play school sometimes. I like your door sign requesting that you have nap time and privacy too. You are going to be SO GOOD in school! Auntie Mona sends you big hugs with a big star for such a good job!